Providing the first naturopathic treatment protocol for people with drug and alcohol issues. This section gives further information for health professionals than the previous one designed specifically for clients. Please be sure to watch the eight minute video for an overview from the Discovery channel about the amino acid therapy, and its founder, an American MD named Dr. William Hitt. This article explains why we use a compounding pharmacist and why he/she must place the specific amino acids into the sterile hood, in a specific order and quantity to achieve the optimum results for repairing and regenerating the neurotransmitters of the brain. It is important to use a synergistic formula, rather than placing random amino acids into a bag and hoping for the best. The name protein means "primary element" (proteios, Gr.) for proteins are the primary components of all plant and animal cells. A human is made of ~100,000 different proteins. Proteins are linear "chains," whose molecular "links" are comprised of amino acid molecules. Each of the 20 different amino acids has a unique shape, so that when linked together in a chain, the resulting proteins fold into elaborate 3-dimensional "wire sculptures." The protein sculpture's pattern is determined by the sequence of its amino acid links. The balancing of electromagnetic charges along the protein's chain serves to control the "final" shape of the sculpture. The unique shape of a protein sculpture is referred to as its "conformation." In the manner of a lock and key, protein sculptures compliment the shape of environmental molecules (which include other proteins). When proteins interlock with the complementary environmental molecules, they assemble into complex structures (similar to the way cogged "gears" intermesh to make a watch). When proteins chemically couple with other molecules they change the distribution of electromagnetic charges in the protein. Changes in "charge" cause the protein to change its shape. Therefore, upon coupling with chemicals, a protein's will shift its shape from one conformation to another conformation. A protein generates "motion" as it changes shape. A protein's movement can be harnessed to do "work." Groups of interacting proteins that work together in carrying out a specific function are referred to as "pathways." The activities of specific protein pathways provide for digestion, excretion, respiration, reproduction, and all of the other physiologic "functions" employed by living organisms. Proteins provide for the organism's structure and function, but random protein actions can not provide for "life." Scientists needed to identify the mechanism that "integrates" protein functions to allow for the complex behaviours. Their search was linked to the fact that proteins are labile (opposite of stabile). Like parts in a car, proteins "wear-out" when they are used. If an individual protein in a pathway wears-out and is not replaced then the action of the pathway will stop. To resume function, the protein must be replaced. Consequently, behavioural functions were thought to be controlled by "regulating" the presence or absence of proteins comprising the pathways. The source of replacement protein parts is related to "memory" factors that provide for heredity or the passing on of "character"
What success rate are you having right now with your current patients with addiction challenges? It seems that the industry standard successful recovery across North America is 16-20% and that is based on being clean for one year. We at Agora felt that there must be something out there that could offer a higher chance of recovery, so we researched every program until we discovered this one. This amino acid therapy protocol has been used in the US and Mexico on over 10,000 patients, and the success rate is claimed at over 90% after five years. This warranted further research, and we talked to several patients who completed this protocol. Agora sets the bar a bit higher by adding other therapies to ensure success. Addiction is a complex disease of drug chemistry, brain chemistry, thought processes and social interactions. Research has shown that addiction involves the reward centers in the brain belonging to the limbic system, which is emotionally driven and recently shown involvement of the frontal cortex; our rational, conscious brain area. Much focus on addiction centers on the brain chemical dopamine. Dopamine has shown to increase in concentration in the limbic (middle) brain regions when abusive drugs are consumed. As the magnitude of drug-induced dopamine increases, the reports of reinforcing properties (the "high"), appear to decrease. Thus, the addict must use larger amounts of the drug over time, to achieve their original "high" state. This reaction implies that dopamine involvement in drug addiction is likely mediated by functional and structural changes in the neural circuits. Some of the structural changes observed recently are decreases in volume of the frontal lobe with certain drug use. Research has demonstrated frontal lobe volume losses in abusers of cocaine, heroin and alcohol. With the frontal cortex being involved in rational, conscious thought, reduced function impairs these top-down processes causing a loss of self-directed, willed behavior. Thus the addicted loses their inhibitory controls and defaults to stimulus-driven behaviors, facilitated by the drugs. The cycle of addiction can be broken down into 4 main areas; drug intoxication, drug craving, drug bingeing, and drug withdrawal. As stated previously, drug intoxication involves higher extra cellular dopamine concentrations in the limbic as well as frontal regions of the brain. 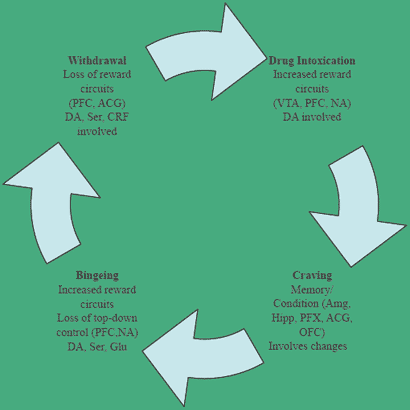 Drug craving is a learned response involving social and environmental cues. Memory for the drug experience is housed in the amygdala and hippocampal regions, and involves activation of the thalamo-orbitofrontal and anterior cingulated areas to manifest the craving experience. Blood sugar metabolism has been shown to be intimately linked in the craving stage. Compulsive drug administration (bingeing) involves a loss of inhibitory processes and has been shown to involve dopamine, serotonin and glutamine circuitry in the thalamo-orbitofrontal and anterior cingulate gyrus areas. Drug withdrawal results in disruption of behavioral circuits, culminating in dysphoria, dysthymia and irritability. These changes have been shown to involve frontal cortical circuitry, and the neurochemicals dopamine, serotonin and corticotrophin-releasing factor. It has also been noted that the dopamine receptor (D2) availability decreases with increased drug exposure. The D2 receptor pathway involves reward circuits in the brain, and thus with decreased receptor availability, a potential for increased risk of addictive behavior ensues. It has been shown that the mesolimbic dopamine circuit which includes the nucleus accumbens, amygdala, and hippocampus, is associated with the acute reinforcing effects of the drug and also with the memories and conditioned responses linked to cravings. The mesocortical dopamine circuits, which include the prefrontal cortex, orbitofrontal cortex and anterior cingulate gyrus, are likely involved in the conscious experience of drug intoxication. At Agora, the NRR intravenous treatments utilize a select formulation of amino acids, vitamins and minerals. The amino acids selected are the building blocks for the creation of healthy neurochemicals and the vitamins and minerals are the cofactors in that process. Specifically tyrosine for dopamine, tryptophan for serotonin, glutamine for GABA and phosphatidyl choline for acetylcholine, in addition to others. Thus, the addict's system has their chemical needs met in a positive way as these amino acids aid in re-establishing a healthy balance of neurochemistry. This reduces withdrawal symptoms as there is not a chemical void in the system but rather the replacement with a healthy alternative. Over the course of treatment, neurochemistry stabilizes, cellular structures repair, and the addictive storm subsides, creating the potential for positive change. Goldstein, R, Volkow, N. Drug Addiction and Its Underlying Neurobiological Basis: Neuroimaging Evidence for the Involvement of the Frontal Cortex. Am J Psychiatry, 2002. 159:1642-52. Dispenza, J. Evolve your Brain. Health Communications, Inc. 2007. An important part of the recovery process is detoxification. Significant quantities of the toxic drug residues can be found residing in the fatty tissues of the body. A scientifically based program of therapeutic detoxification can bring about enormous improvements in health, vitality and brain function. Saunas and steam baths have been used since ancient time by cultures around the world to induce detoxification. Traditionally, saunas have been used to improve mental clarity, to diminish pain and promote longevity. In the past few years, it has been shown that saunas greatly assist in the elimination of accumulated toxins. The radiant heat of a Far-InfraRed sauna causes a profound deep sweat. The skin is our largest organ and sweating is one of the body’s most important ‘detoxification’ pathways. As the heat penetrates through the skin into the deeper tissues of the body, the toxins are released from the fat inside the cells. After about 30 minutes of exposure, the blood vessels of the skin dilate increasing the flow of blood to the surface to support the cooling process. The millions of sweat glands covering the body are infused with fluid from the blood. In turn, they empty to the skin’s surface, thereby flushing large amounts of toxins, including chemicals and addictive drugs, from the body. Since the liver and kidneys are not involved in this process, there is no further burden to these organs. This is a distinct advantage for persons with substance abuse whose livers and kidneys may already be under toxic stress. The Far-InfraRed sauna provides a wider array of therapeutic benefits compared to a regular sauna or steam room. The gentle soothing heat penetrates deeper into the body (2” vs. 2mm). As it enhances the metabolic processes of vital organs and glands, greater amounts of toxins are eliminated. Painful joints and muscles are relieved with the increased blood flow. Even though the temperature is cooler (110-130F in Far-InfraRed sauna vs. 180-210F in a regular sauna), 2 to 3 times more sweat is released! The comfortable and relaxing experience will leave you with a greater feeling of well-being. This is the only method of detoxification evidenced in current nutritional, medical and bio-chemical literature capable of significantly reducing or eliminating stored toxic residue with scientifically proven safety, according to Dr. David W. Schnara, Science Advisor to the Environmental Protection Agency. “Many people with chronic illnesses find the high temperatures inside a regular sauna or steam room intolerable. In these traditional systems, the inside of the body is heated completely from the surface of the skin. Even though you feel very hot in these units, the heating is quite shallow - only a few millimetres below the skin. In the Far-InfraRed sauna, invisible light rays emanate from several Far-InfraRed emitters. This Far-InfraRed light penetrates deep into the fat and muscles of the body, creating a more powerful detoxifying influence upon the deeper tissues of the body. As well, since the air temperature remains much lower than in a traditional sauna, the individual feels more comfortable. Sweating often begins before the person feels very hot at all and the sweating is more profuse than in a traditional sauna”. Tissue Cleansing & Your Health... “Many of the illnesses facing modern society have strong links to the environment. Cancer rates are rising every year with all fingers pointing at the lifestyles and environment of our population. Diseases virtually unheard of twenty years ago, such as Chronic Fatigue Syndrome and Fibromyalgia, now exist in epidemic numbers and these numbers continue to rise with each passing year. Many people wonder why they feel exhausted, their head seems to be in a fog, and they so frequently have to live with pain. The stress of accumulated toxic substances may be a primary factor in the poor health of millions of North Americans. There are now hundreds of thousands of toxic chemicals released into the environment daily. Heavy metals, pesticide and herbicide residues, solvent residues and by-products of fossil fuel combustion can be found in significant measurable quantities in the bodies of virtually every human on this planet. A scientifically based program of therapeutic detoxification can bring about enormous improvements in health, vitality and brain function. This past decade has seen great advancements in the science of therapeutic detoxification and effective programs are being developed worldwide at reputable environmental medicine clinics. Saunas and steam baths have been used for centuries by cultures around the world to induce detoxification. Traditionally, saunas have been used to improve mental clarity, to diminish pain and promote longevity. In the past few years, Hyperthermic [sweat] therapy has been studied quite extensively and several papers on this subject have appeared in the scientific literature. Through this research, it has been shown that saunas greatly assist in the elimination of accumulated toxins. Toxic metals including mercury, as well as organic toxins such as PCB’s and pesticide residues, are excreted in high quantities in the sweat during properly conducted Hyperthermic therapy sessions. The past 150 years have been a time of incredible progress for medicine, science and industry. Because of these advancements we now enjoy longer, more productive lives. However, there are many who pay a tremendously high price for our modern lifestyle. The by-products of our chemical technology have resulted in ubiquitous contamination of our atmosphere, lakes, oceans and soil. Our natural environment is now permeated by a barrage of “unnatural” substances. Unquestionably, many of the chemical sources have been in existence for centuries. However, today we are exposed to chemical concentrations far greater than were our ancestors. Although the human mechanism is known to be accommodating , ecological alterations are now occurring at a faster rate than our bodies are able to adapt. We are now faced with a situation where inadequacies or uncertainties centring around the manufacturing, use, storage, and disposal of toxic chemicals, have resulted in an overwhelming number of environmentally -induced illnesses. There is currently a wealth of scientific evidence showing that thousands of drugs, preservatives, pesticides, and other pollutants remain stored in the body long after exposure. We know for example that an organochlorinated pesticide such as the metabolites of DDT have a half life of between 20 and 50 years in the fat deposits of humans. According to the U.S. Environmental Protection Agency over 400 chemicals have been detected in human tissue; 48 were found in adipose tissue, 40 in breastmilk, 73 in the liver and over 250 in the blood. The process of bodily accumulation and storage of toxins is known as “toxic bio-accumulation”. Though the predominate storage site in the body is the fatty tissue, toxins may re-enter the bloodstream during times of physical stress (i.e.. illness, fasting, excessive heat, exercise) or emotional stress. Every organ that is accessible to these chemicals, which have been mobilized or released from the fat, is being continually exposed at low levels. As stated by Dr. William L. Marcus, Senior Advisor and Chief Toxicologist for the U.S. Environmental Protection Agency, “It’s a chronic exposure. That’s why chemicals like dioxin, even in small amounts, are extremely dangerous. Unfortunately the human body has no previous experience with these chemicals and there is no natural machinery in the body to break them down, much less eliminate them. Human accumulation of such compounds as DDT, PCP, PCB, and dioxin, reflect biologically persistent chemicals which are partitioned in the body from water into lipids. Eventually the metabolizing of xenobiotics (chemicals foreign to the biological system) leads to the accumulation of the chemicals and/or their products in lipid deposits throughout the body, particularly in adipose tissue. The simple chemistry involved in this process can be illustrated by the fact that some chemicals readily dissolve in water, while others dissolve only in oil bases. Oil soluble chemicals therefore have a tendency to accumulate in body fatty tissue or lipids, which are also insoluble in water. There is no such thing as a fat “cell”...[rather] almost every cell has a fat component. The brain has a high fat content as does virtually every organ. There is a wealth of literature documenting illnesses in humans from exposure to chemicals as listed above. These illnesses include cancers of virtually every organ system of the body, as well as leukaemia, liver disease, pulmonary damage, anemia and blood changes, nervous system disease, immune system damage, psychological damage, reproductive and fertility impairment, and kidney dysfunction. There are also many sub-clinical abnormalities that are suspected to result from presumed chemical exposure and the list grows longer each year. One of the best passive exercises is the radiant heat of an infrared sauna which, causes a profound deep sweat. After about 30 minutes of exposure, the blood vessels of the skin dilate to allow more blood to flow to the surface to support the cooling process. The millions of sweat glands covering the body are infused with fluid from the blood. In turn, they empty to the skin’s surface, thereby flushing large amounts of toxins, including toxic acids and heavy metals, from the body. Inhibits the development of pleomorphic microforms [fungi, yeasts, bacteria and molds] and creates a ‘fever reaction’ of rising temperature that neutralizes them. Places demand on the heart to work harder thus, exercising it and also producing a drop in diastolic blood pressure (the low side). Stimulates dilation of peripheral blood vessels thus, relieving pain (including muscle pain) and speeding the healing of sprain, strain, bursitus, arthritis, and peripheral vascular disease symptoms. Promotes relaxation thereby creating a feeling of well-being. For those who are unable to exercise sufficiently, for whatever reason, the radiant heat infrared sauna is an excellent way to get the benefits of exercise without undue stress on the skeleton, muscles, and associated tissues. Such people have an even greater need for exercise and the sauna fills the bill. Sweating: The Body’s Cooling and Cleansing Mechanism. We associate certain negative connotations with it and often try to prevent the process altogether, but sweating is in fact, an important and healthy bodily function. Essentially, sweating serves two purposes: firstly, it is the means by which our body cools itself in response to a rise in temperature, and secondly, it is one of the primary pathways for clearing contaminants from our system. Our bodies are deeply warmed in the Far-InfraRed sauna. In response to the rise in body temperature, the hypothalamus (the part of the brain that regulates body temperature and metabolism) activates our complex thermoregulatory system. This involves several mechanisms including an increase in heart rate, cardiac output and a dilation of blood vessels. Body temperature is kept within the normal range through the process of sweating. When the body heats up, the heart rate increases to pump the warmed blood away from the internal organs towards the skin. Blood vessels dilate, increasing blood volume and flow to the skin. Heat is transferred from the blood to the sweat and is released into the air from the skin’s surface. The cooled blood therefore cools the body. As you continue to use the Far-InfraRed sauna, you gradually become ‘acclimatized’ and generate more and more sweat. The volume of sweat produced in the Far-InfraRed sauna is profuse, amounting to 2-3 times that in a regular sauna. Acclimatization increases cardiac output, raising blood flow from a normal 5-7 quarts per minute to as much as 13 quarts per minute. As mentioned before, inducing a heavy sweat in the sauna for detoxification purposes is an ancient tradition practiced by different cultures around the world, and wisely so. The combination of modern Far-InfraRed heating technology with the ancient sauna ritual has resulted in an effective way to deeply cleanse the tissues of the body. In response to the warming effect of Far-InfraRed, heart rate, cardiac output and metabolic rate increase. These reactions provide a ‘passive exercise’ effect, which amazingly, can burn up to 600 calories in 30 minutes. Far- InfraRed has been researched by NASA and determined to be an ideal way to maintain astronauts’ cardiovascular fitness during space flights. Modern day environmental toxins often become trapped within our bodies. Far-InfraRed energy has the ability to mobilize these tissue bound toxins, which are then expelled in our sweat. Our tissues absorb Far-InfraRed energy up to a depth of 2” thus, the sauna releases toxins from throughout our body. Contaminants, including mercury, lead, pesticide residues, solvents and by-products of fossil fuel combustion, are expelled through the skin thus, bypassing the liver and kidneys. Avoiding placing a toxic burden on one’s liver and kidneys is a major advantage of sweat detoxification. Far-InfraRed has been used throughout Europe and Asia to treat a wide array of muscular- skeletal ailments. Conditions such as arthritis, bursitis, Fibromyalgia, backache, sprains and strains often benefit from this deeply penetrating heat. Far-InfraRed stimulates cardio output and causes blood vessels to dilate. The enhanced blood flow brings pain relief and healing to muscles and other soft tissue. The sauna is often helpful in the treatment of acne, psoriasis and eczema. Skin is left soft and smooth with improved tone and elasticity as the profuse sweating experienced with Far-InfraRed deeply cleanses the pores. “Give me the power to create fever and I shall cure any disease.” An artificial fever is created in the sauna as the Far- InfraRed deeply warms our bodies and aids our immune system. This is a relaxing and effective way to “nip a cold or flu in the bud”! Today, scientific research has validated Parmenides’ practices. Many researchers have observed enhanced production and function of immune system agents stimulated by Far-InfraRed and other forms of hyperthermia. T cells, Natural Killer cells, B cells etc. are different types of white blood cells. They use a variety of means to protect the body by neutralizing and destroying disease-producing substances, such as viruses, toxins, bacterium and mutated cells. Far-InfraRed energy provides many therapeutic effects. In addition to sweat detoxification the other most common applications of Far-InfraRed technology have been pain relief and healing. The special ceramic heaters in the sauna emit a very specific and narrow band of infrared wavelengths. These heaters were developed in Japan by Dr. Tadashi Ishikawa in 1965 and their therapeutic benefits have been researched by the Japanese ‘InfraRed Society’, composed of medical doctors and physical therapists. Over 700,000 whole-body treatment units are in operation in the Orient and their popularity is quickly spreading to other parts of the world including North America. Millions of smaller infrared devices are used in the Orient, Europe, Australia and North America for localized therapy providing pain relief and the stimulation or our natural healing mechanisms. Far-InfraRed has been effectively used in the treatment of arthritis, bursitis, fibromyalgia, backache, sprains, strains and many other muscular-skeletal ailments. How Does Far-InfraRed provide Pain Relief and Promote Healing? Additionally, Far-InfraRed reduces levels of lactic acid in the body. Lactic acid is a by-product of muscle metabolism that causes soreness and stiffness especially following exercise. “Energy medicine is very old, ...at least as old as the first Qigong masters and other ancient practitioners of healing touch therapies. These healers all had in common the ability to emit energy through their hands. Contemporary researchers have now proved that these forms of energy medicine use wavelengths in the infrared range.